This uniquely shaped pasta combines the sophistication and herbal garden-freshness of chopped chives with the punch of zesty garlic. We add just enough freshly cracked black pepper to give it some pizazz. 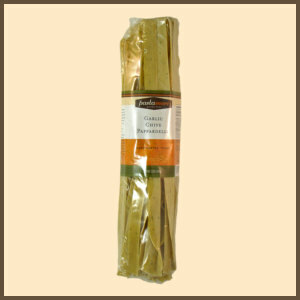 Take these flavors and incorporate them into our soon-to-be-famous, lovely, thin & silky 'pappardelle' noodles, and you have an impressive culinary dinner offering. Easy pairings include a heart-healthy drizzle of our Asian Dipping Oil or our Sundried Tomato and Harissa Oil. 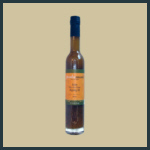 Try our White Truffle Oil for a bit of sophistication. Tossing in some steamed vegetables, grilled Italian sausage, or pork medallions will provide for a memorable meal. Note: We have a mix & match package where you can choose any three pastas for $21 - a $3 savings! Click here! Our pasta packages are all 12 ounces, and will serve three to four. Nan’s pastas are all hand-crafted and made with 100% durum semolina. 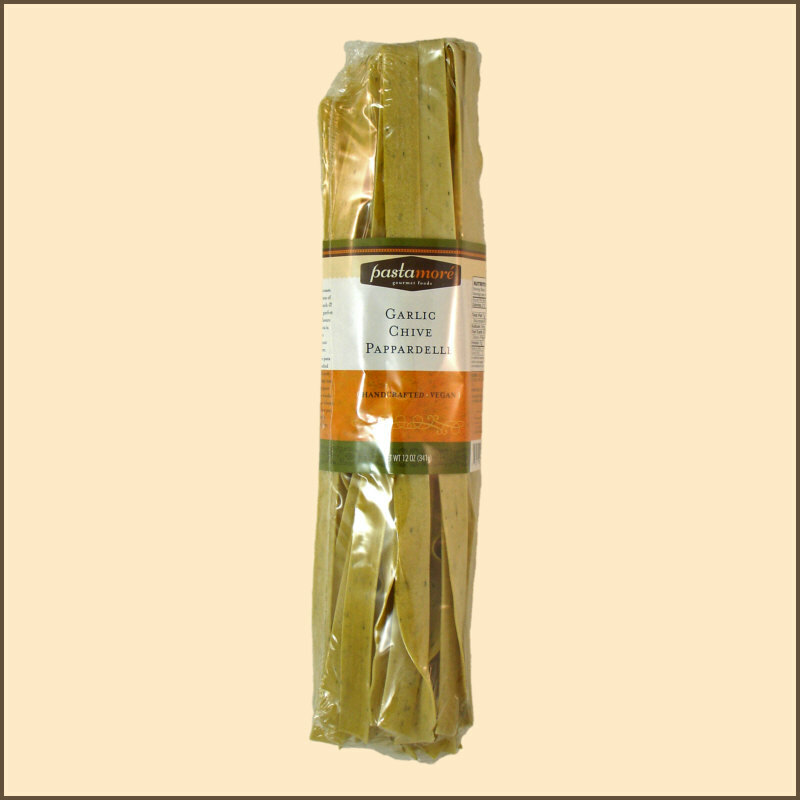 At the time the pasta is being made all-natural flavor elements are added to the dough – from pureed vegetables to herbs and spices. The result is delicious pasta which needs nothing more than a drizzle of olive oil or some butter to be intensely satisfying. 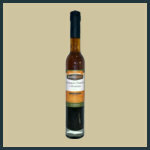 To create this distinct exotic oil we start with California grown olives, garlic and white wine vinegar. We build complexity of flavor and Far East character with ginger, lemon, cilantro, sesame and even some wasabi. This is truly an original. Truffles are one of the world's most complex and mysterious foods, this oil captures the essence of the best truffles without the expense. 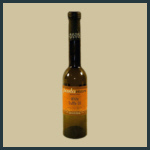 This olive oil is infused with the exotic flavor of white truffles sometimes known as the "fruit of the woods".